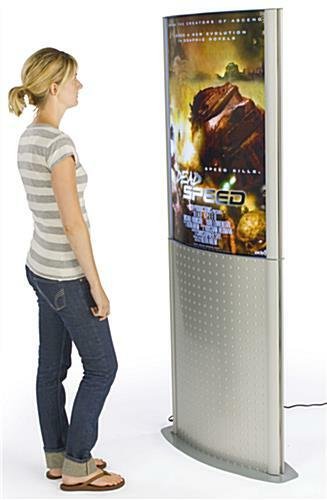 These illuminated poster floor stands illuminate graphics measuring 24"x36" on each side of the fixtures. The double sided displays use LEDs to create an edge lit presentation, making them great for advertisements in retail stores, movie theatures and restaurants. 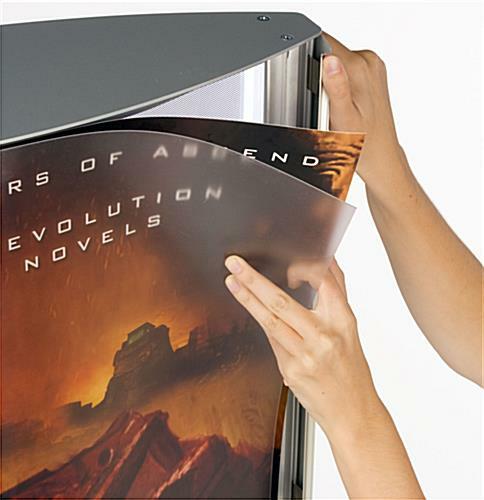 Made of strong aluminum, the poster floor stands have a durable fabrication that allows them to last for years. The fixtures' LEDs are also long-lasting and operate with a low voltage, making them very cost effective. The aluminum floor stands for movie displays have a neutral silver finish that blends in with any environment. These double sided displays feature a snap open frame that makes it easy to change graphics. 28.0" x 71.0" x 7.5"